The esophagus can be divided in a cervical part (pars cervicalis) and thoracic part (pars thoracalis). The cervical esophagus first runs dorsally than at the right side of the trachea. The crop (ingluvies) is a ventral sac-like diverticulum located at the junction between the cervical and thoracic part (see: crop). There is no distinct border between the thoracic part and the proventriculus of the stomach but mostly a esophageal tonsil is located here. 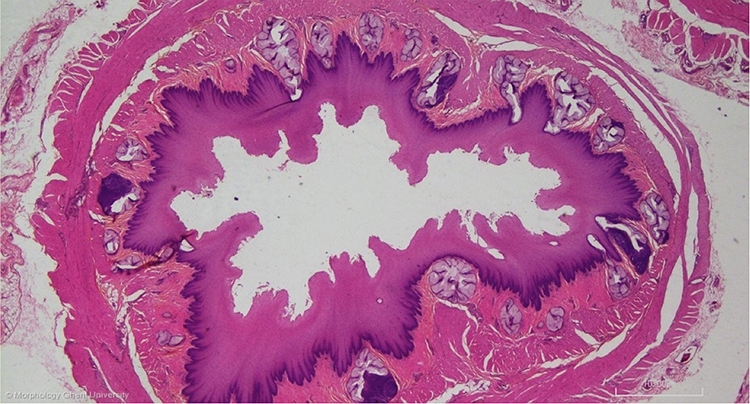 The wall of the avian esophagus is composed of the typical layers. The mucosa is strongly folded.